Amsterdam, c.1602, Latin text edition. 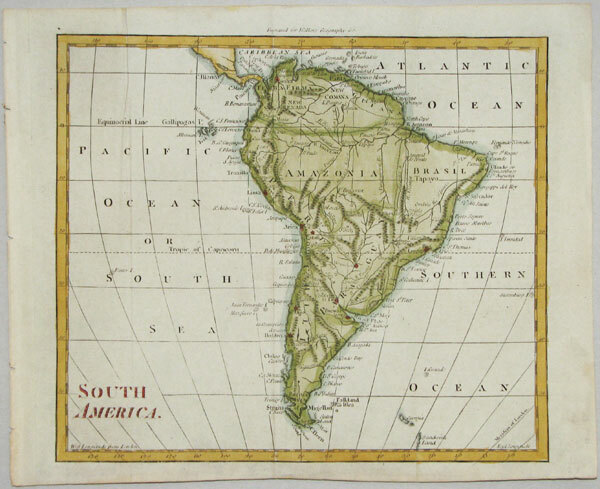 Untitled map of South America, engraved by Pieter van den Keere. This is the earliest of two plates used to illustrated the Bertius atlas, without longitude and latitude scales. It was replaced by a new plate by Jodocus Hondius in 1616. London, 1801. Published in 'Walker's Geography'. London: 1825. 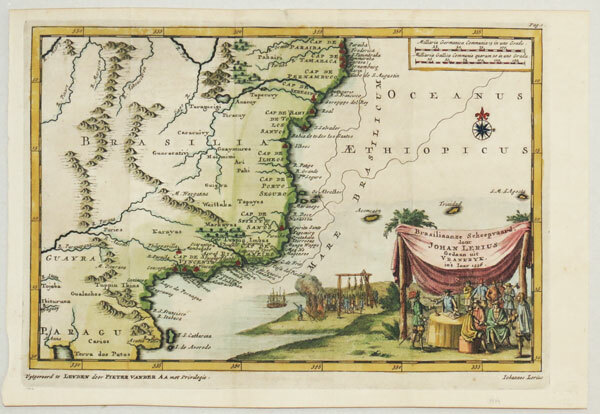 A précise of a six-sheet map. London: Baldwin & Cradock 1836. 16 maps on one sheet, including the Azores, Canaries, Madeira Cape Verde Islands, St Helena, Ascension, Bermuda and the Falklands. Paris, c.1692. Peru and the course of the Amazon, with the mythical Lac Parime and El Dorado. Engraved by A. de Winter for the quarto edition of Sanson's atlas. Paris, c.1760. With Buenos Aires & Montevideo. Early view of Buenos Ayres. n.d., c.1800. The Argentinian capital. London: John Tallis & Co., c.1851. 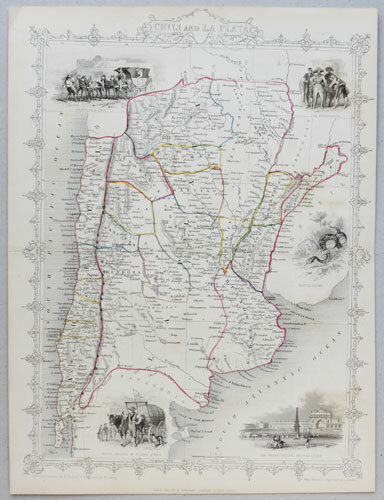 Decorative map of Chile and Argentina, before the two countries expanded south into Patagonia, with decorative vignettes including a view of the Grand Square of Buenos Ayres. Paris, c.1760. 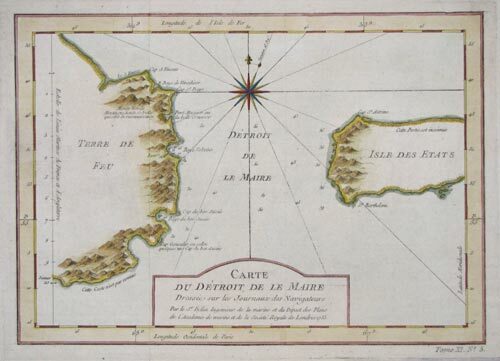 The Le Maire Straits were discovered in 1616, as the Dutch explorers Jacob Le Maire and Willem Schouten were attempting to find a better route from the Atlantic to the Pacific than the dangerous Magellan Straits. They discovered Cape Horn shortly afterwards. Frankfurt: Theodore de Bry, c.1596. 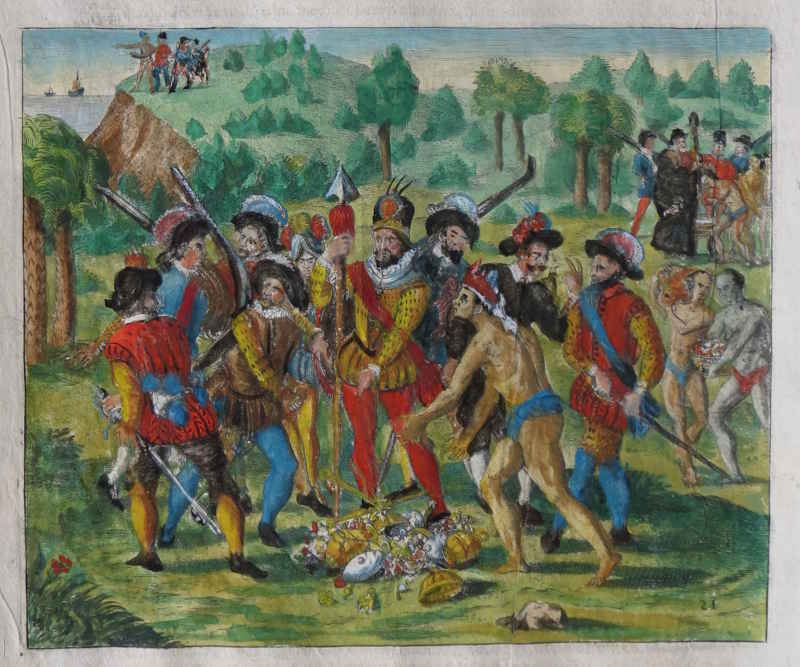 Spanish conquistadors standing around a pile of treasure brought to them by the locals. On the left one Spaniard has his hand on his sword hilt, about to draw it. Frankfurt: Theodore de Bry, c.1596. 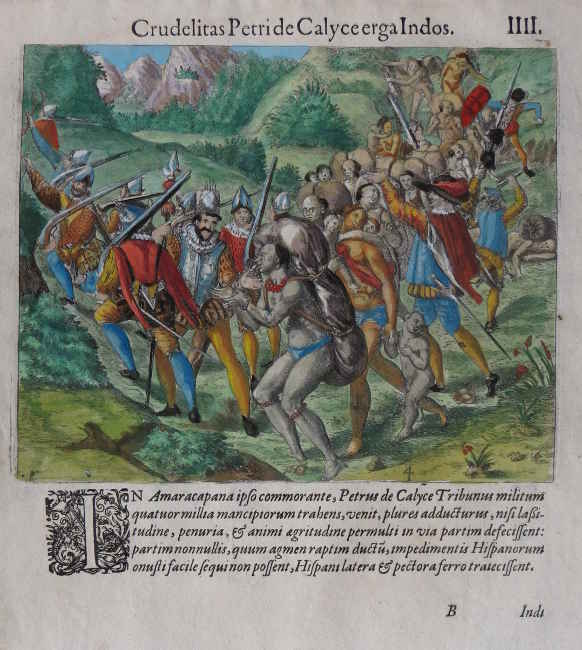 A gruesome scene of Brazilian warriors disposing of prisoners, killing, butchering and cooking them. Frankfurt: Theodore de Bry, c.1596. 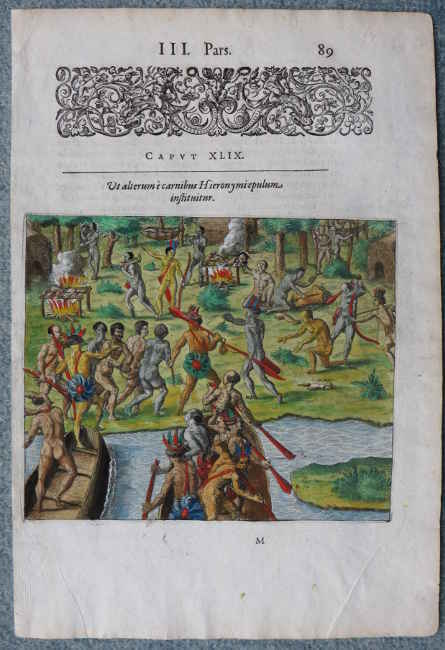 Two tribes, naked except for headdresses, fire bows at each other. On the right two Europeans join in with muskets. Frankfurt: Theodore de Bry, c.1596. 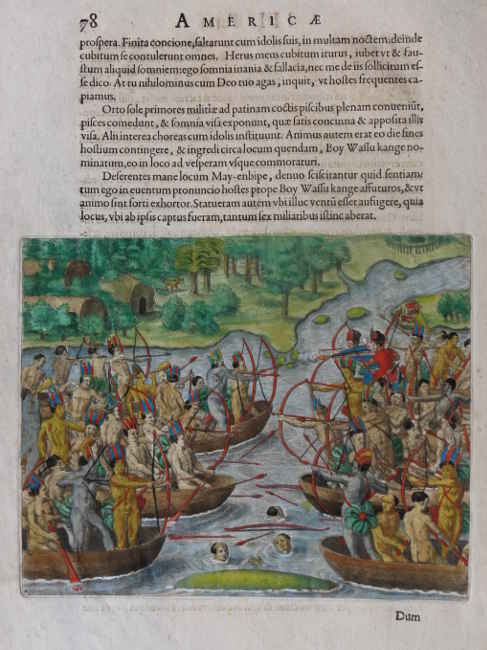 Spanish conquistadors mistreating American indians,. Paris, c.1692. 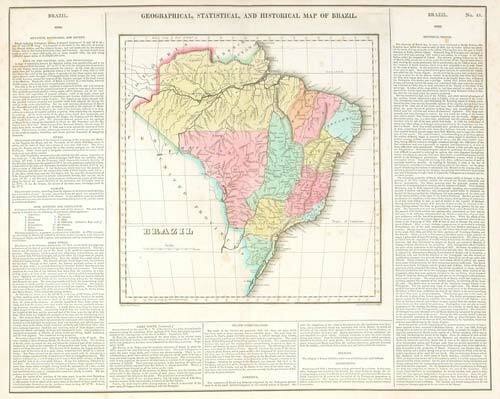 Brazil, showing the Portuguese administrative divisions on the coastline. Engraved by A. de Winter for the quarto edition of Sanson's atlas. Utrecht, 1705. 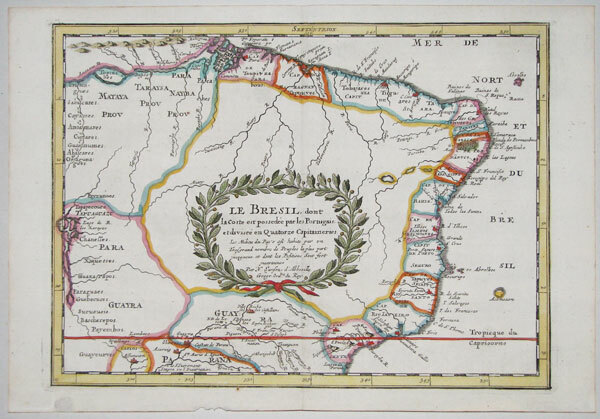 Map of Brazil, with a garland title cartouche filling the interior. Leiden, 1707. 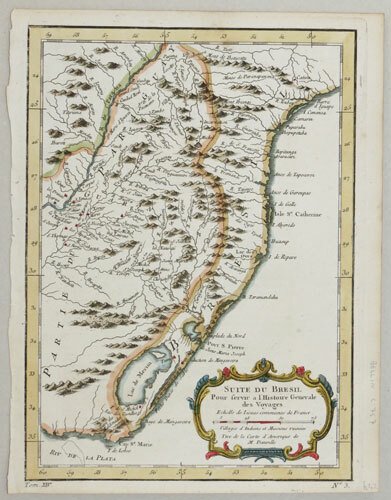 A map of the environs of Rio de Janeiro, published to illustrate Jean de Léry's account of his experiences in Brazil as a member of the Chevalier de Villegaignon's attempt to colonise Brazil for France. de Léry (1536-1613), a Protestant, joined the expedition expecting religious freedom in the new colony of 'France Antarctique', but religion split the colony, making it easy for the Portuguese to defeat it. The title cartouche features a well-filled gallows, perhaps illustrating the religious strife. 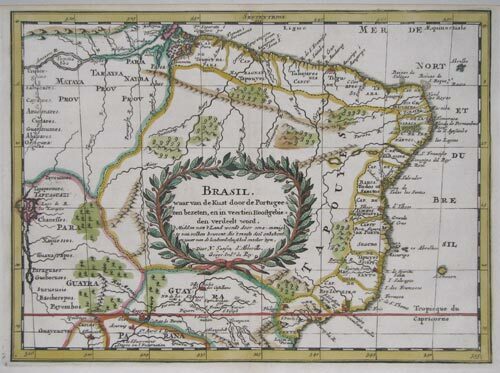 Returning to France de Léry published his 'History of a Voyage to the Land of Brazil', which van der Aa included in a collection of important voyages, with this map. Paris, c.1757. 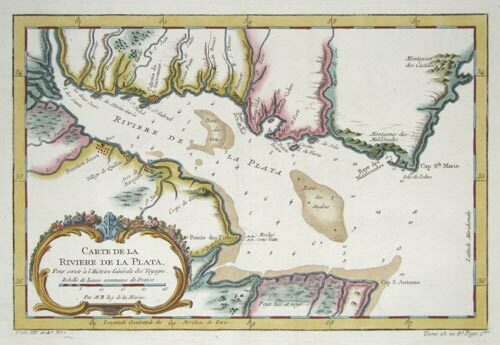 Map of Rio Grande so Sul in southern Brazil & Uruguay to the mouth of the Rio de la Plata. Paris, c.1683. 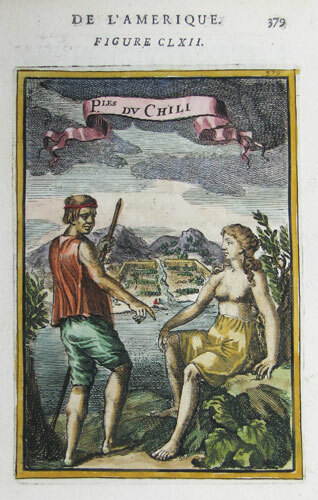 A Chilean couple with their villiage in the background, published in Mallet's 'Description de l'Univers'.